On August 1st, 1966, Charles Whitman killed his wife and mother before heading to the University of Texas. There, he headed to the campus clock tower where he killed three people on his way to the observation deck. Once there, he began shooting people on the campus below at random, ultimately killing 11 more and wounding 32 before he himself was shot and killed by police officers. The whole incident lasted just over an hour and a half. 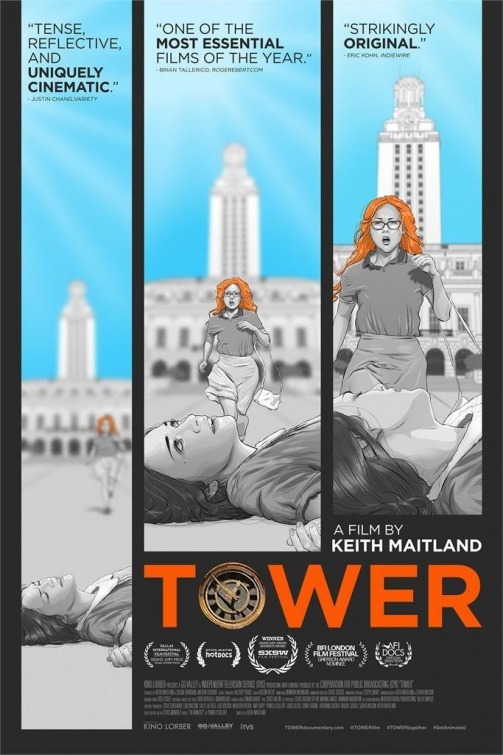 The new documentary TOWER doesn't much care who Charles Whitman was or why he did what he did. Rather, it is concerned with the people he victimized, and those who engaged in acts of heroism both large and small during Whitman's assault. Their stories are told mostly through rotoscoped animation very similar to the style utilized by Richard Linklatter in WAKING LIFE and A SCANNER DARKLY (not too surprising given that some, though certainly not all, of the animators worked on one or both of those films). Although the dialogue is drawn from interviews with people who were involved in the incident, their animated counterparts are voiced by actors until near the end, when the survivors are shown and get to speak for themselves directly. As one might expect, this is a very emotional film. There is horror, of course, and tragedy. But there are also stories that give one a little faith in humanity, such as the student who put herself in harm's way to stay beside another wounded student she didn't even know. And the guilt that one police officer, undeniably a hero in this affair, still feels for making a decision he believes led to at least one other person dying who might not have otherwise. Powerful stuff. The approach taken by director Keith Maitland, working from Pamela Coloff's 2006 article for Texas Monthly entitled 96 Minutes, is not a documentary in the pure sense. It's not quite what we think of as a traditional "based on a true story" docudrama, either. It sticks to the facts (or at least as close to the facts as witness testimony, particularly witness testimony several decades removed, ever can be), but presents the stories of its participants in a gripping, dramatic way that makes this dark day come to life. 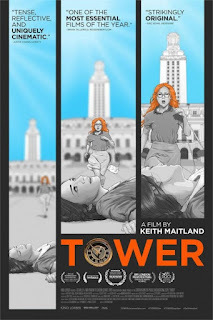 Some might argue that a more traditional talking heads and stock footage documentary is more "authentic", but it's hard to deny the immediacy and effectiveness of Maitland's film. 4 out of 4 stars.